Yes, I'm starting another novena. With all the financial woes around blog-land these days, I thought I'd share it here and offer up your intentions along with my own. 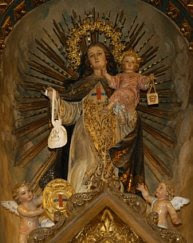 Our Lady of Good Remedy was credited with helping the Trinitarians purchase Christian slaves out of slavery and Mother Angelica has also asked for help to keep EWTN afloat. Here's a link to the novena. I started tonight, and will continue through September 11. Feel free to start yours at a convenient time for you!